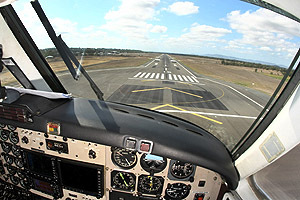 The Australian aviation industry recognises that ADS-B will support the future of air traffic control by allowing pilots to directly see nearby aircraft on a cockpit screen, improving safety and efficiency. To achieve this, it is necessary for aircraft to transmit their position, altitude, and other flight data, for other aircraft and ATC to use. Our first priority has been to encourage fitment of ADS-B technology in IFR aircraft. New rules to support the use of ADS-B in IFR aircraft are in place and many IFR operators have fitted ADS-B equipment. For VFR aircraft, this transition will take quite some time. As a first step, the industry has noted the relatively low cost of equipping with ADS-B capable Mode S transponders as new aircraft are acquired, or existing aircraft have their transponders replaced. The European Mode S mandates have triggered the availability of low cost Mode S transponders from several vendors, including those with inbuilt GPS receivers. CASA regulations have already come into force requiring all VFR aircraft manufactured after 6 February 2014; operating in Class A, B, C, E or in Class G above 10,000 feet and aircraft installing a new transponders after 6 February 2014, to have installed a Mode S transponder (with Flight ID input) which is ADS-B capable. If fitting a new transponder Post 6 February 14 a Mode S transponder is required unless the aircraft is restricted to operations Below A100 in Class G and Class D. In such areas a mode C transponder is acceptable. Due to the current cost of GPS equipment that produces the required level of accuracy and integrity, the Australian aviation industry has recommended that there should be no requirements for the installation of GPS equipment suitable for ADS-B use in VFR aircraft. The recent release of TSO-C199 by the FAA may provide a way to lower the cost of ADS-B avionics for VFR-only aircraft. CASA is currently investigating how this type of equipment could be integrated into Australian airspace under Project AS 16/06. However, that does not mean that VFR aircraft should not take advantage of ADS-B services with existing avionics, in many aircraft, a suitable GPS data source is already installed. Why has the Australian aviation industry selected Mode S transponders? allow ATC radar to get error-free information about aircraft identity and altitude. “Classic” transponders have no parity or error checking, but Mode S transponders do. A Mode S transponder with ADS-B capability is able to receive position and integrity data from a GPS and to transmit ADS-B messages on the same frequency as the ATC transponder, using the transponder transmitter and antenna. When purchasing transponders, aircraft owners and operators should exercise caution. Not all Mode S transponders have the capability to support ADS-B. Any Mode S transponder purchased for use in Australia must be capable of receiving data from a GPS and transmitting ADS-B messages. At this time, there is no legal requirement to interconnect transponders in VFR aircraft with GPS equipment. However, it can be easy and cost-effective to do so when replacing a transponder, thereby gaining the safety and operational benefits of ADS-B.